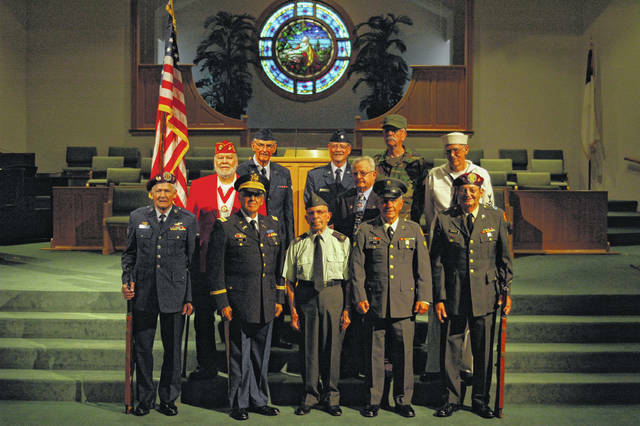 Members of First Baptist Church have been working together to honor veterans for Memorial Day, and will host Medal of Honor recipient Hershel “Woody” Williams on May 27 at 10 a.m.. All are welcome to attend. GALLIPOLIS — First Baptist Church in Gallipolis will host Medal of Honor recipient Hershel “Woody” Williams for a special Memorial Day service Sunday, May 27, at 10 a.m.
Each year a small committee of veterans at FBC get together and plan a special service in honor of Memorial Day and to recognize active duty soldiers and veterans. Emphasis on Memorial Day, according to participants, allows the committee to focus their appreciation and care for veterans in a deeper way by concentrating more on one specific holiday to commemorate veterans. The service will feature military flag presentations by veterans for the five branches of the military and the POW-MIA flag. The guest speaker will be featured with special emphasis during the ceremony. When the committee began planning for this year’s service, one member suggested getting Williams to some disbelief from Marr. “There is a committee of four of us. One of our members said ‘What about Woody?’ I said if you think you could, go for it. I didn’t think (Woody) would consent to do that because he’s in his 90s, but we are delighted to say the least. He will be a hard act to follow in future years,” said Marr. According to Marr, Williams’ message will be Bible based and a benefit to veterans in attendance. The theme for the service follows, “The memory of the just is blessed,” a direct quote from Proverbs chapter 10 verse 7. The theme was chosen because organizers feel the service has such emphasis on the memory of those who have served in the military and fought for justice. Williams is recognized for heroism above and beyond the call of duty during the Battle of Iwo Jima in World War II. He is reportedly the only surviving marine to have received the Medal of Honor from World War II. Williams enlisted in May of 1943. When American tanks ran into concrete pillboxes, Williams pushed ahead with a flamethrower in an attempt to clear machine gun fire from reinforced enemy positions. During that time, Williams was covered by reportedly four riflemen while fighting for four hours, avoiding small-arms fire. He would return to friendly lines to gather serviced flamethrowers and demolition charges and then return to the front to face the enemy front repeatedly.